Place names are a big challenge in your family tree. Can you improve yours? I'm working on a new family tree project that I hope to share with you soon. My goal is to create visualizations of my family tree like you've never seen before. I'm preparing the data for this project, going through long spreadsheets almost one line at a time. But I discovered something along the way. In fact, I discovered lots of things: errors that no software tool can find for me. They're human errors that are obvious only to the human that made the errors. Me! What I had was a very long list of every address or state or country in my family tree, and each name associated with it. As I scrolled through the list, I saw my mistakes: I had people associated with places I know they've never been. It's easy to click the wrong suggested place. Time to find those errors. 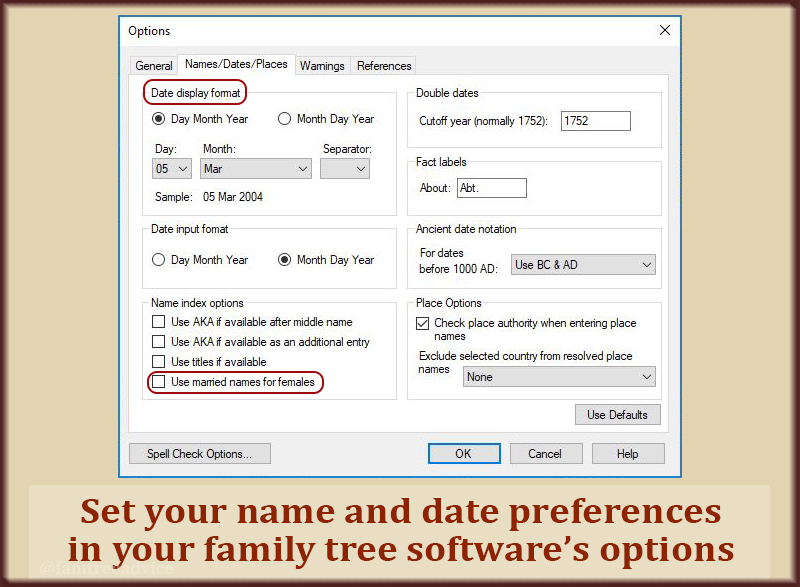 Family Tree Maker is great about suggesting place names as you type. Each time I start to type "Italy" I see the next suggestion is a place called Italy Cross in Canada. And I did it. I accidentally associated two 18th century Italians with Italy Cross, Canada by mistake. I made a similar mistake with a couple that lives in Argentina. Who even knew there was a place called Argentina, Alajuela, Costa Rica? 2nd Error Type: What Was I Thinking? I had another man from Pennsylvania associated with Hamilton, Bermuda. It's marked as a departure, citing the New York Passenger Lists as a source. But there's no date, no image, and no travel companion. It seems like a complete mistake. And since this man is the father of an ex-in-law, I'm deleting the whole fact. I also spotted a style error. My standard for U.S. addresses is to spell out the word County. For example: 328 Superior Street, Youngstown, Mahoning County, Ohio, USA. In the long list of places in my family tree, I saw a couple scroll by that were missing the word County. It may not be a big deal, but I'd rather have it be right. The people are gone, but their addresses linger on. While looking for an example of a place name missing the word County, I found another type of error. An address belonging to no one. It probably belonged to someone who used to be in my tree. But I've decided to limit the scope of some far-flung branches. Because I deleted a lot of people, I may have a bunch of straggling place names like 17 Halls Heights Avenue. To find these types of errors in your family tree, you can start by browsing the list of places you've used. Family Tree Maker has a Places tab. RootsMagic has a Place List. I don't use FamilySearch, but I don't see a lot of control options there. Do any places stand out as being odd to you? I ran the Family Tree Maker Place Usage Report to generate a list, but it doesn't include places that have no people associated with them. 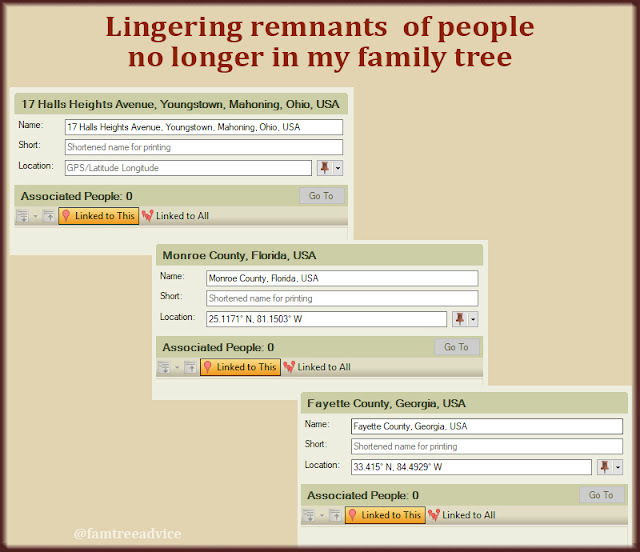 Add this task to your Rainy Day Genealogy List or your I'm Bored Genealogy List. It's another effort that'll make your family tree that much stronger. Case Study on "How Is That Possible?" Here's a lesson that supports my earlier post, "How Is That Possible?" 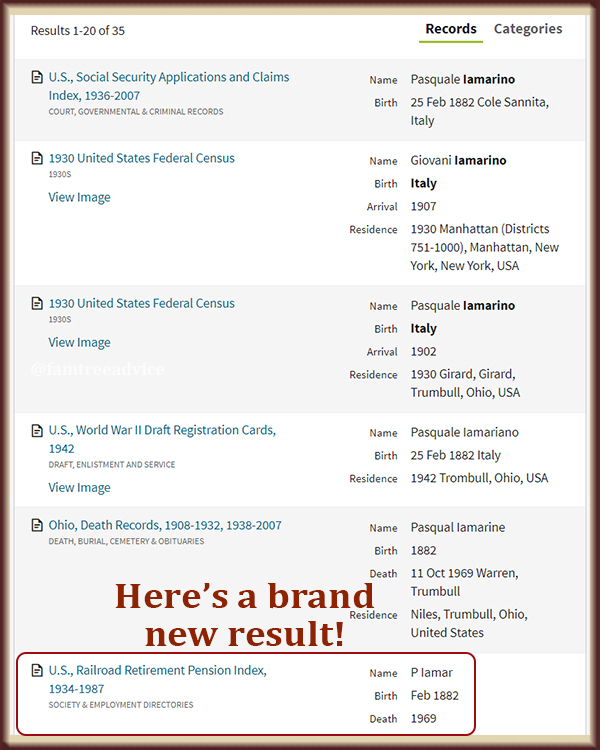 When my recent post about Italian marriage records led me to discover a mistake I had been making, I spent three solid days correcting my tons of such records in my enormous family tree. The work was tedious, but after a while I realized that this change I was making—reclassifying certain dates as "marriage license" rather than "marriage"—provided the answer to a question that had come up a number of times. I had quite a few men (these are small-town Italian men in the 1800s) who had gone through the process of posting their intention to marry a woman and then seemed to marry her, but went through the same process with another woman a month later. What was going on? Divorce was not a thing, and the first woman had not died. In fact, I had proof that the first woman then went through the process with another man and married him. Once I learned that they had not gotten married, but had merely obtained consent to marry, it became clear: The first couple intended to marry but something prevented the marriage. Each of them was then paired with someone else whom they did marry. See When is a Marriage Not a Marriage? I feel this corrected and more logical information makes my family tree even more solid. So I ran Family Tree Maker's built-in error report and uncovered a page full of birth date discrepancies. Some people had two birth dates from conflicting resources, while others had an original placeholder date that had been superseded by documented facts. So I was able to clean up all of the errors. I even figured out and fixed the error I highlighted in How Is That Possible? where I had two Michele Leone's with the same birth date. The date belongs to my grandfather's first cousin; the other Michele Leone is a more distant relative born a different year. Now I'm itching for other discrepancies to fix! Here's a lesson that supports my earlier post, "O Brother, Where Art Thou?" I have one branch of my family where the information was pretty scant. 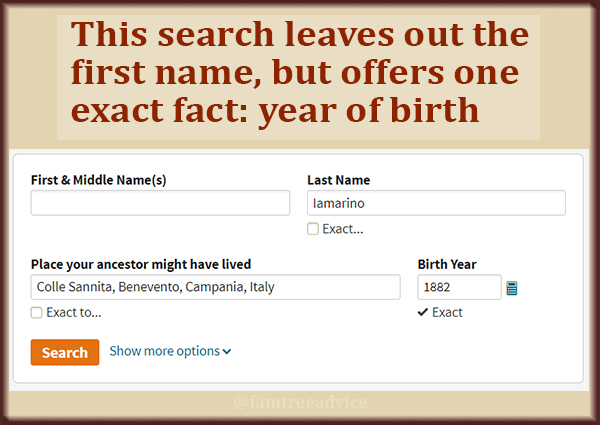 In fact, I never knew my great grandmother's maiden name was Caruso until the eve of my first trip to Italy—the trip that sparked my interest in genealogy. Later I heard from a distant cousin named Michael who was very interested in the Caruso family tree and shared a great deal of first-hand information with me. As with any information I receive without documentation, I set about proving all of the facts Michael had shared with me, and in doing so, I learned quite a bit more facts. My great grandmother, Maria Rosa Caruso, had at least four older brothers, all of whom came to upstate New York in the very early 1900s. Giuseppe came here first because each of this brothers' ship manifests says they were joining their brother Giuseppe at 827-829 Canal Street, Elmira, New York. Maria Rosa's ship manifest was the hardest to find, and even after finding it, I was not sure it was the right Maria Rosa Caruso for quite some time. The manifest has some facts that are correct for her (born in 1880 or 1881 in Pescolamazza, and coming to join her brother Giuseppe), but it also has facts that do not work. The manifest says she was married as of July 1906, but that doesn't work because I have her November 1906 marriage certificate from Hornell, New York. It also says her final destination is Addison, New York. While that is not terribly far from Elmira, or even Cameron, New York, which is another place her brother Giuseppe lived, I have no facts putting any members of this Caruso family in Addison. There is an address beneath her brother Giuseppe's name, but it appears to say "236 Bore". I can't make anything out of that. I kept returning to this 1906 ship manifest and finally noticed something very important. Where the manifest shows an "m" for married, in a much lighter color there is an "S" for single overwriting the "m". (See the far-right side of the image.) So it was an error. That left me with the troubling town of Addison. But in a web search today I discovered that Addison was the end of a particular railroad line that connected with the New York Central Railroad. So there is a good possibility that Maria Rosa had her ticket from New York City to Addison and then had to get on the Erie Railroad to get to her brother. At that time, Giuseppe lived in Cameron, New York, on a street parallel to the railroad tracks where he worked. I can see a railroad line on Bing Maps that runs from Addison to Cameron. And on her marriage certificate, Maria Rosa lists her residence as Cameron. Now I feel as if the 1906 ship manifest finally makes sense. And this illustrates how important it is to gather as many provable facts as possible about your ancestor and their entire family. They say the "unexamined life is not worth living". I say the "unexamined family tree is not worth publishing"! Occasionally you need to analyze your family tree to see if anything looks illogical. Your family tree software may alert you if you’ve entered facts that are impossible, such as a woman giving birth when she’s a little girl or after she’s dead. But it won't alert you if your facts show a person living in two different states at the same time. 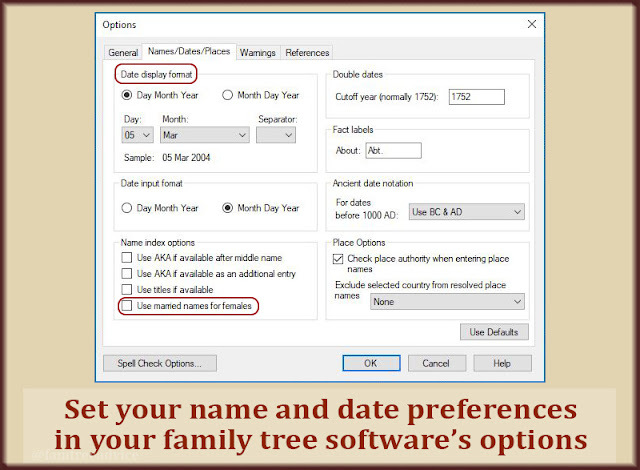 See why I think Family Tree Analyzer may be perfect for you. Don't leave impossible facts in your family tree. but 2 with the same birth date? Recently I was adding census data to my family tree. One set of facts said the wife came to America two years before her daughter. If this were true, it would mean she left her infant daughter in Italy, came to join her husband in America, and didn’t send for her baby for another two years. That's highly unlikely and can only be proved or disproved by finding the mother and daughter’s immigration records. These types of logic errors are what I frequently find in other people’s family trees—a big reason why I never accept someone else's research without seeing the documentation. Many times, these errors are difficult to spot and difficult to solve. I like to put a bookmark on people with a logic error so I can quickly see where more investigation is needed. See what type of reporting features your software may have. Whatever tools you can use, your tree will benefit from a logic scrubbing.